What would you do if you end up staying in an age-old town house where the fire alarm starts beeping for just about 15 minutes of baking? Sigh!, now you know the reason why I haven't been doing any serious baking off late. I tried every trick and trade known to make it work but I failed miserably. Once it starts beeping, all you can do is open up all doors and windows and allow the *smoke* to get out. Either the fire alarm is too sensitive or our oven is way too old or I am crazy enough to start a baking attempt every single time with the same gusto. ..Well, this time, I was adamant to bake some cookies before I leave this place and did the unforgivable - "wrapped a plastic bag around the fire alarm, did all the baking I wanted and removed the bag once I am done!". :D :D.
Ok now, enough of my ranting and lets get down to business. 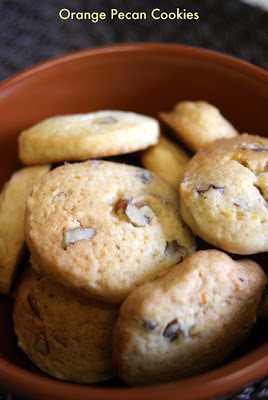 Shall we - for some delicious, heavenly, melt-in-mouth Orange-Pecan cookies. Never before this, I loved the flavor of orange zest so much. How in the world, didn't I either make or atleast taste this recipe before. :) I had promised some of my office friends to bake some cookies for them. So, the recipe yileds more than 4 dozen of them depending on their size. Please use your discretion, for appropriate measurements to make lesser number of cookies. Type 1. The consistency of drop cookie dough allows it to simply be dropped from a spoon onto a baking sheet, making it the easiest kind of cookies to bake. Tupe 2. For refrigerator cookies (also known as Icebox cookies), the dough is shaped into logs, wrapped in plastic, then refrigerated until firm enough to slice and bake. Type 3. Shaped cookies are formed by hand into various shapes (such as balls, logs, crescents etc) or are pressed through a cookie press. Type 4. Cutout cookies have a firmer dough. To make it easier to handle, the dough may need to be chilled before being rolled out. Then the dough is cut into shapes with a cookie cutter or knife. In a large mixing bowl, cream butter and both the sugars until light and fluffy. Beat in the egg, orange juice and orange peel. Combine the flour, baking soda ad salt. Gradually add to the creamed mixture and mix well. Stir in the pecans. Shape into rolls. The original recipe states to make two 1.5 inch rolls. But, I made 4 smaller rolls. (into a cylindrical shape), wrap each of them in plastic wrap. Refrigerate fpr 4 hours or overnight. I chilled them for the entire night. Next morning (or after 4 hours), preheat the oven to 325 degree F. Unwrap dough, cut into 1/4 inch slices. Place them 2 inch apart on a lightly greased baking sheets. Bake for 10-12 mins, until the edges begin to brown. Have a very close watch on these, for every 3-4 mins as they easily tend to burn. The oven temparatures might vary according to the type of baking pan used. Darker the baking sheet, lesser time it takes to bake. You can also wrap the baking sheet with aluminum foil, grease it and then use. (thats what I did). Once done, remove onto the wire racks to cool completely. 1. Avoid over mixing of the dough. If its handled too much, the cookies will be tough. 2. Let the baking sheets cool before placing the next batch of cookie dough onto them. Otherwise, the heat from the baking sheet will soften the dough and cause it to spread. 3. Use an over thermometer to verify the accuracy of the oven. To check, preheat it to the desired temperature. Place an oven thermometer on the center rack. Close the oven door and leave the oven ON at the set temperature. Keep the thermometer in the oven for 15 minutes, then check. If the thermometer does not agree with the set oven temperature, the oven temp is inaccurate. Adjust the oven temp accordingly. The theme for this month's Healing Foods is Onion, hosted by Priya. Hop onto her blog for participation details. Loved the cookies! Great recipe. Better get that fire alarm checked out! Cookies looks plump and crisp. Wonderful Orange flavor! Love orange flavored cookies a lot. Nice recipe. Looking so good. YUM! ohh thats a night mare to have a fire alarm like that in a food blogger's house. the cookies look crispy and perfect round shapes. Was waiting for the recipe after seeing your status on FB. Love the addition of orange zest. Woww Scrumptious cookies, lovely combo for a cookie Siri...feel like grabbing some..
Wow cookies look awesome! Love the orange flavor in it. Ashaji - It doesn't matter anymore Ashaji. We are gonna vacate the house anyways next Friday. :). I hope you have a wonderful blogging break and lovely summer. Parita - They are indeed very flavorful. Everybody in our office loved them :). Priya - I wish I could send some for you Priya. :D indeed orange & pecan make a lovely flavor combo. Been waiting for you to post the recipe! Just love the flavour of oranges in cakes, can't wait to try them in cookies. This one is a must try. Looks good to try. Difficult to get pecans, shall substitute almonds. cookies look awesome and love the mild citrusy flavour in them..